Nutriment Raw Chicken Formula contains 85% fresh meat, offal and bone. It's a complete raw dog food made of fresh raw meat, which provides your dog with the right quantity of protein. 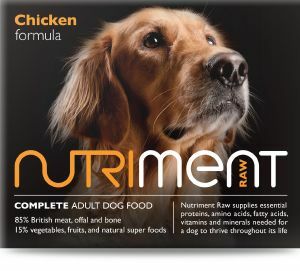 Specifically produced for adult dogs, Nutriment Raw Chicken Formula also contains 15% vegetables to ensure that they receive a complete and balanced diet. Wheat Grass Juice Powder, Barley Grass Juice Powder, Chicory Root Powder. Nutriment Raw Complete Dog Food is one of our best-selling lines. Browse our Raw Dog Food section to discover more recipes. Top delivery company for our doggie .. great customer service this raw food is great quality and price. Her coat is so much healthier and she is much calmer as it’s all raw and natural. My dog loves the chicken.